I’m very excited about a collaboration with Bushel & Peck’s in Beloit, WI! On Earth Day, Saturday, April 22nd I will join the B&P team for an introductory class covering all the basics you need to get yourself ready to preserve the harvest this coming growing season. 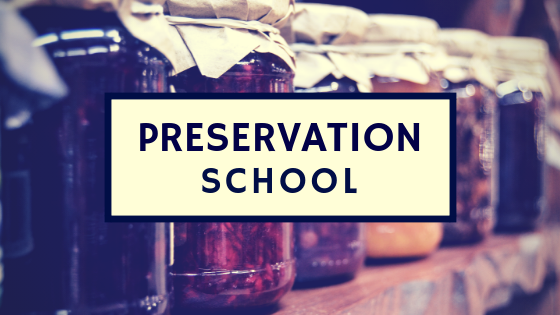 We will cover the basics of preservation, canning, jam making, pickling and all the safety measures in the process. Make classic dill pickles and learn to make the most delicious strawberry jam! After learning the basics you’ll feel comfortable branching out to try new vegetable pickles and other fruits as jams as the harvest season goes along. Class is $40.00 per person is on Saturday 4/22/17 from 2:00 – 4:30 PM. To register, please visit the Bushel & Peck Etsy listing. Jam – a chunky, sweetened fruit spread made with crushed fruit. Jelly – a smooth fruit spread made with fruit juice. Marmalade – a jam specifically made with citrus fruit. Conserve – a jam with added raisins and/or nuts. Chutney – jam with the addition of vegetable, spices and vinegar characterized by it’s sweet and sour flavor. Preserve – whole fruit preserves in it’s own jelly, so that the shape of the fruit is retained (not crushed). This term is also used generically to refer to any of the above types of fruit spreads. So, now that you can tell the difference between the different types of fruit spreads, which ones are your favorites? I’m partial to jellies, but a good jam can’t be beat either! Kingry, J., & Devine, L. (2006). Complete book of home preserving: 400 delicious and creative recipes for today. Toronto: R. Rose.